What a brilliant day we had on Sunday! 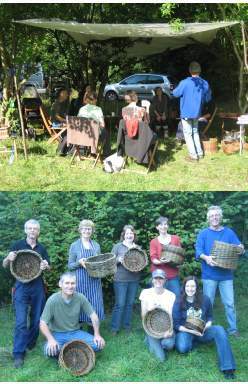 Ed our tutor was excellent, he ensured everyone had a finished basket and was so patient with us. The organisation of the event was very well done, Jane made us feel very welcome and the cakes and drinks were provided whenever we wanted. The setting where we spent our day was quite magical and we were lucky to have really good weather. I had a thoroughly lovely day and would recommend you to all, I will certainly like to attend future events you hold.